Bees with “backpacks” can still eat, control their flight and perform other normal behavior. Bees with tiny electronic devices on their backs could sound like a researcher’s dream come true, or like a science-fiction novelist’s nightmare come true. Shyam Gollakota, an associate professor at the University of Washington’s Paul G. Allen School of Computer Science and Engineering, prefers the optimistic view. He and his colleagues at UW have found a way to pack environmental sensors into a backpack small enough for a bumblebee to carry. The approach, which the UW team calls “Living IoT,” brings significant advantages over the human-made kind of drones. 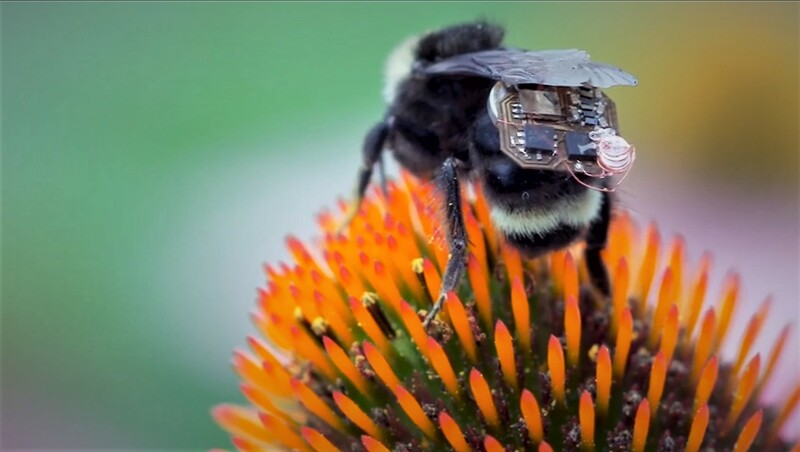 This entry was posted in GeekWire and tagged Bees, Internet of Things, Science, University of Washington. Bookmark the permalink.